Message 1110518 - Posted: 27 May 2011, 19:51:28 UTC - in response to Message 1110517. Give the guys from Overland our thanks. It is really great of them to be helping out like this. Message 1110520 - Posted: 27 May 2011, 19:55:55 UTC - in response to Message 1110517. Thank you Eric, and Thank you Overland Storage! Message 1110590 - Posted: 27 May 2011, 23:39:50 UTC - in response to Message 1110578. Thanks everyone for all the hard work. Party hardy! Thanks for your work and update!! Message 1110697 - Posted: 28 May 2011, 8:59:32 UTC - in response to Message 1110517. Sad to hear this, but THANKS to ERIC! Az okos emberek Linuxot használnak. I'm just happy to be kept informed of progress, and it's good to know that the ptoblems are being worked on. If things are worth having, they're worth waiting for. Message 1110745 - Posted: 28 May 2011, 12:57:39 UTC - in response to Message 1110517. Message 1110757 - Posted: 28 May 2011, 14:11:06 UTC - in response to Message 1110752. Message 1118243 - Posted: 17 Jun 2011, 12:15:25 UTC - in response to Message 1118227. "Number Crunching" is just the name of the forum where all the computer geeks hang out. If you have a technical problem, even if it is related to the news, your questions are best asked in there. Message 1118281 - Posted: 17 Jun 2011, 15:18:55 UTC - in response to Message 1118227.
beambender, nach Deinen Stats sieht es so aus, daß Du E@h und S@h laufen lässt. Wenn Du hier bei S@h in den Einstellungen 10 Tage setzt, dauert es einige Zeit bis alle Projekte das übernehmen. 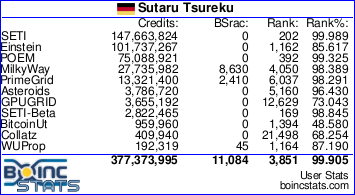 Du solltest das erste Projekt bei dem Du die Einstellungen verändert hast in BOINC aktualisieren. 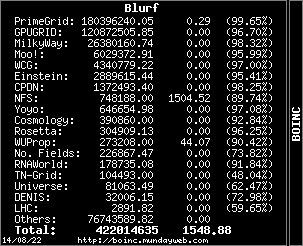 Oder, vielleicht hast Du schon genug E@h WUs für 10 Tage in BOINC. Es kommt auch darauf an, wie die %-Verteilung der Projekte ist. 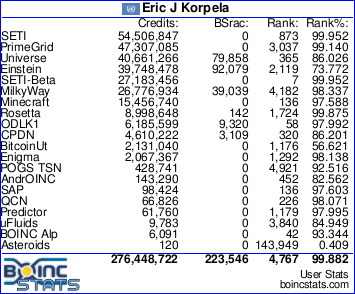 Benutzt BOINC online oder lokale Einstellungen? Für weitere Fragen komm doch einfach mal rüber ins NC Unterforum. Message 1126536 - Posted: 10 Jul 2011, 9:14:18 UTC - in response to Message 1126505. I have also not been getting regular WUs for several weeks & finding uploads very slow & unreliable, I've now dropped my Seti project percentage to put my cycles to more effective use. If you have a problem then put it in the Number Crunching Forum, but you may want to check these threads out first before posting. Panic Mode On (50) Server problems? Please post problems or issues to the Number Crunching forum, not the News Forum. Thank you.